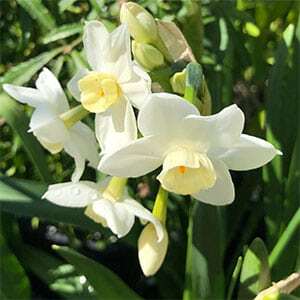 A tall growing early flowering Jonquil , Polly’s Pearl get its name from the pearly white flowers. Very easy to grow and a good bulb for warmer climates, the flowers are fragrant and it will grow well in the garden or in pots. This is an excellent Jonquil to plant beneath deciduous trees, it will flower before the trees put on foliage and add colour to the area. Jonquil varieties are best planted in clumps of 5 or more for a good display. Choose a well drained soil and a sunny position. Bulbs should be planted at around 10 cm deep and 10 cm apart. Water in after planting with a liquid seaweed fertiliser. After flowering, allow th foliage to die back naturally before removing. In containers, use a general purpose fertiliser in late winter, and divide and repot every 3 years. You can plant the bulbs a little closer in containers if desired, however you may need to divide more frequently. AVAILABILITY – Bulbs are available for sale from late summer into early winter, check with listed suppliers.